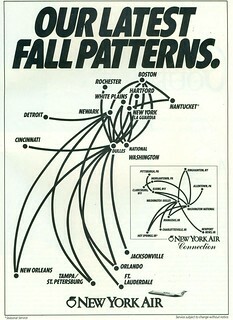 New York Air route map from December 1985. With the 28th anniversary of its merger with Continental Airlines on 1 February, a look at the Texas Air Corporation’s competitive response to the Eastern Air Lines Shuttle in the 1980s at near its peak. The airline’s Boston-New York LaGuardia-Washington National shuttle operation was the basis of the current Delta Shuttle, which launched in 1991 after Delta acquired the assets from Pan Am who bought them from Texas Air Corp in 1986. Continental drew down New York Air’s Washington Dulles hub after the three-way merger with New York Air and People Express - including the assets of bankrupt Frontier Airlines - in February 1987. 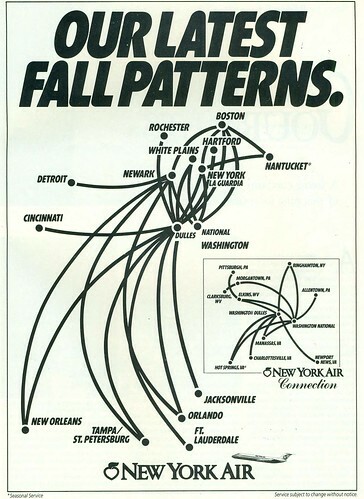 New York Air operated 28 aircraft, including four 737-300s, 17 DC-9-30s and seven MD-80s, on 1 December 1985, the Ascend Fleets database shows.